← The Sports Archives – 10 of the Most Frustrating Things in Golf! The Sports Archives – Extreme Motocross – Three Challenges You Must Conquer! Motocross is something you can dabble in, or something you can pour everything you’ve got into. I started dabbling at the advanced age of 30-something. I had a fantastic instructor, good equipment, the will, and the guts to learn. I had already done a lot of off-road trail riding on my own. I didn’t see anything standing in my way. At the time, my husband and I were Captain and First Mate aboard a yacht in Cozumel, Mexico. The owners rarely used the boat so while we had to work hard to maintain it, we also made time to water ski, scuba dive, freedive, and ride motorcycles. There was a small, rough, supercross style track on the island, and we helped organize a group of riders into a club so we could groom the track. We bought truckloads of what passes for dirt on an island built of coral reef, rented a bobcat to rebuild the jumps, and spent hours with picks and shovels removing pointy rocks, bits of rebar, and other junk that could injure us. We joined the Mexican Motorcycle Federation so we could compete in sanctioned races. It was fun, crazy, dangerous, and a great way to stay in shape. We talked a lot about taking time off from yachting and going back to the States to compete for real in the Veteran’s Series, but the one challenge we could never conquer was giving up our terrific source of income so we’d have the time to dedicate to getting serious about the sport. Unlike soccer, this sport requires a sizable upfront investment. First, you need a motorcycle. A new one will run between $5,000 and $8,500 depending on the brand and model. The personal safety gear can add another $1000. You need a trailer or at least a pickup truck to get to the track for practice and races. Amateur riders may be eligible for sponsorship, and this can cover some of their expenses, but count on spending a lot of money, especially if you are going to travel to compete in a series of races. I remember, years ago, reading about the top female motocrosser, a teenager, whose parents spent roughly $30,000 that year so she could make it to all the races to earn her title. The difference between a dabbler and someone who is extreme about motocross is the amount of time the rider, and their support team, can put into the sport. A teenager obviously has more free time than an adult with a job, but the teen rider needs to have the support of their parents, and they in turn need to be able to take the time off to drive to races. If you, as a rider, have overcome the fear of high-speed cornering and jumping, you’ve won the battle. As a minor, winning the war means helping your parents overcome the fear of seeing you crash and being airlifted to a hospital. I’ve witnessed several friends breaking bones, and have had my share of concussions. Now that I have a daughter of my own, I’m constantly apologizing to my mother for all I put her through. Lizzie E loves adventure, travel and the outdoors. Her global experiences are colorful and full of thrills. The Best Motocross Crashes – Ever! 5 Great Motocross Circuits In The UK! This entry was posted in Motorsports and tagged Mexican Motorcycle Federation, motocross, motocross archives, motocross blogs, motorcycle racing, motorcycle sports, motorcycles, sports and leisure, Sports Archives, Sports Blogs, supercross. Bookmark the permalink. 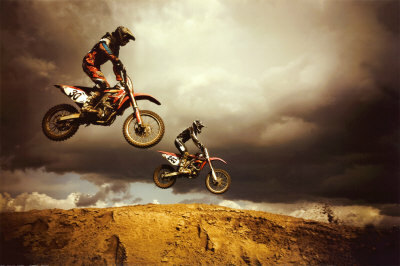 8 Responses to The Sports Archives – Extreme Motocross – Three Challenges You Must Conquer! At 40 riding motocross is still a dream but dreams are never lost but they can be forgotten. Thanks for sharing this excellent information. Its good to be fast and safe. If you are on this kind of sport, portective gears are very important.